These two cards are basically the same but I thought my first attempt was too girly so I swapped out the last layer of very vanilla. 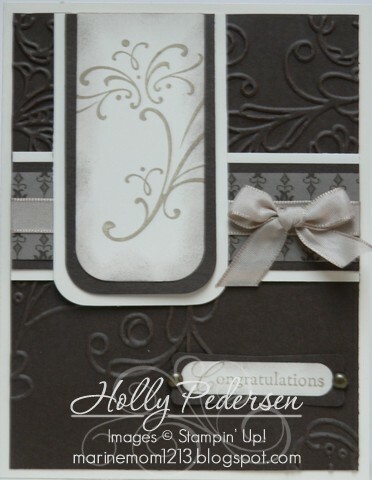 I used early espresso embossed with elegant lines folder and then added layers of very vanilla cs and early espresso dsp. 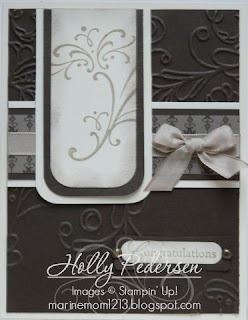 I then used wedding bliss stamp set on the right and the lattice embossing folder on the left with early espresso ink sponged on it. The ribbon is kraft taffeta. Happy Holly-days! !